Guerillascope | The Social Cost of Travel Marketing? The Social Cost of Travel Marketing? It’s a question many marketers in the travel industry are asking: should advertisers take budget away from ‘traditional’ media channels and reallocate it to social media? For many of us – particularly young adults – social media platforms such as Facebook, Instagram and Pinterest have replaced guidebooks and ‘experts’ as primary sources of holiday inspiration. We’re now placing much greater stock in other people’s authentic experiences, tips and advice. In fact, 52% of Facebook users confess to dreaming about a getaway when on the platform, whilst 69% of millennials claim that FOMO is a major driver in their purchase of last-minute holidays! For brands looking to leverage the power of these genuine customer experiences, platforms such as Storyful.com are becoming key. Storyful functions as a social media newswire carefully curated to promote verified, truthful content contextualised to enhance engagement between users and brands. It enables advertisers to build profiles of what their target audience is interested in, and then sources user-generated content around those insights. The value of this real estate to travel brands is backed by research. According to research from TravelPort, 79% of 18-24-year-olds will take heed of videos and photos posted by friends when researching holiday ideas and destinations; this shows that other people’s experiences hold a lot of sway in purchase considerations, especially among younger adults. Indeed, authenticity has never been more important to so many consumers. In the age of Fake News and pockets of distrust in the mainstream media, it could be the difference between a sale or rebuff. Influencers can be an effective means of conveying this social validity and creating trust, though transparency must always be at the forefront of a brand’s strategy in this area. And then there’s reviews. The same body of research from TravelPort tells us that 85% of people – that’s all ages – claim to use review sites when planning their next getaway. It therefore stands to reason that incorporating this kind of content into a media strategy should be seen as crucial. Let’s return to the question originally posed. Should traditional media budgets be reduced to accommodate social media? The answer is: it kind of depends on who you’re targeting. If you’re going after a younger audience made up of millennials and Gen Y-ers, there may be a case for it. Studies by Expedia highlight that around 50% of these age groups are influenced by Facebook when making a purchasing decision; for Instagram, it’s 46% and 29%. This point risks distorting the reality that ‘traditional’ medias like TV, outdoor and press are no longer effective at drawing younger consumers in, however. The picture is much clearer when focusing on older holiday-goers. 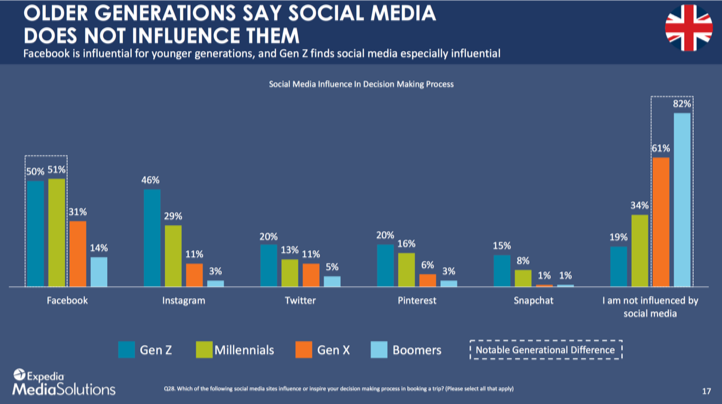 Consumers aged over 34 are a lot less likely to be influenced by social media, indicating a significant generational divide. A combination of TV and out-of-home advertising – reinforced by press and radio – is much more likely to inspire older age-groups into choosing your brand and products. The credibility, emotional pull and audio-visual quality of these medias mean that reallocating budget away from them to social media is likely to weaken the power of your media strategy. Ultimately, the ideal solution to the question is simple: instead of reducing your ‘traditional’ media spend, why not supplement it with additional investment in social? This need not break the bank; in fact, small, incremental increases can deliver the sales activation and shareability that will make it look a snip. And let’s face it: if your business is doing everything right in terms of value-for-money, the quality of customer service and the exciting products it offers, then your customers can practically run your social media strategy for you.